Promotes glucose transport, which stimulates carbohydrate metabolism in skeletal and cardiac muscle and adipose tissue. Also promotes phosphorylation of glucose in liver, where it is converted to glycogen. Directly affects fat and protein metabolism, stimulates protein synthesis, inhibits release of free fatty acids, and indirectly decreases phosphate and potassium. Adults and children: In newly diagnosed diabetes, total of 0.5 to 1 unit/kg/day subcutaneously as part of multidose regimen of short- and long-acting insulin. Dosage individualized based on patient's glucose level, adjusted to premeal and bedtime glucose levels. 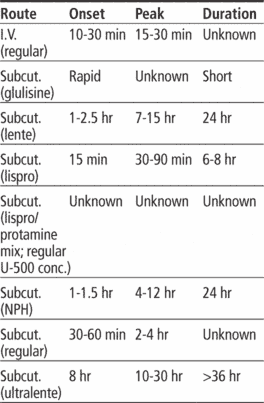 Reserve concentrated insulin (500 units/ml) for patients requiring more than 200 units/day. Adults and children: Loading dose of 0.15 units/kg (nonconcentrated regular insulin) I.V. bolus, followed by continuous infusion of 0.1 unit/kg/hour until glucose level drops. Then administer subcutaneously, adjusting dosage according to glucose level. ☞ Be aware that insulin is a high-alert drug whether given subcutaneously or I.V. ☞ Don't give insulin I.V. (except nonconcentrated regular insulin), because anaphylactic reaction may occur. • When mixing two types of insulin, draw up regular insulin into syringe first. • For I.V. infusion, mix regular insulin only with normal or half-normal saline solution, as prescribed, to yield a concentration of 1 unit/ml. Give every 50 units I.V. over at least 1 minute. • Rotate subcutaneous injection sites to prevent lipodystrophy. • Administer mixtures of regular and NPH or regular and lente insulins within 5 to 15 minutes of mixing. • Monitor glucose level frequently to assess drug efficacy and appropriateness of dosage. • Watch blood glucose level closely if patient is converting from one insulin type to another or is under unusual stress (as from surgery or trauma). ☞ Monitor for signs and symptoms of hypoglycemia. Keep glucose source at hand in case hypoglycemia occurs. ☞ Assess for signs and symptoms of hyperglycemia, such as polydipsia, polyphagia, polyuria, and diabetic ketoacidosis (as shown by blood and urinary ketones, metabolic acidosis, extremely elevated blood glucose level). • Closely evaluate kidney and liver function test results in patients with renal or hepatic impairment. • Teach patient how to administer insulin subcutaneously as appropriate. • Advise patient to draw up regular insulin into syringe first when mixing two types of insulin. Caution him not to change order of mixing insulins. • Instruct patient to rotate subcutaneous injection sites and keep a record of sites used, to prevent fatty tissue breakdown. ☞ Teach patient how to recognize and report signs and symptoms of hypoglycemia and hyperglycemia. Advise him to carry a glucose source at all times. • Instruct patient to store insulin in refrigerator (not freezer). • Teach patient how to monitor and record blood glucose level and, if indicated, urine glucose and ketone levels. • Tell patient that dietary changes, activity, and stress can alter blood glucose level and insulin requirements. • Instruct patient to wear medical identification stating that he is diabetic and takes insulin. • Advise patient to have regular medical, vision, and dental exams. a modified form of protamine zinc insulin suspension. It is an intermediate-acting insulin that is a stable, commonly prescribed preparation. Also called NPH insulin.